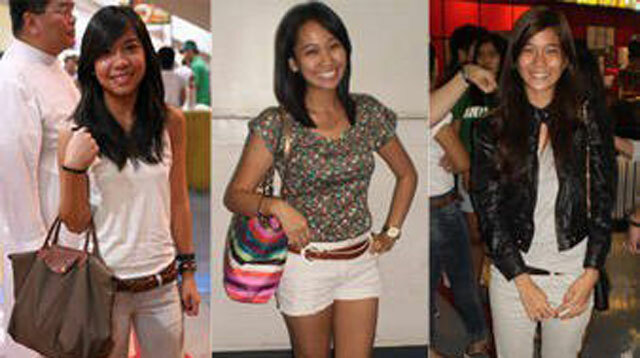 UAAP Season Style Spy: Fasyon Or Laidback When Watching Games? Cosmo attended the opening of another exciting season of college sports, and spotted college fashionistas in the crowd. See what they wore in the name of school spirit. If there's anything college Cosmo chicks among you look forward to in July each year, we're quite sure the University of Athletic Association of the Philippines (UAAP) opening is one of them. After all, aside from getting a rush of school pride as you cheer for your respective sports teams (particularly the men's basketball team), UAAP also means getting a dose of a lot of other fun things: watching cute basketball players, seeing hot basketball fans among the audience, and getting dressed for something else apart from school! You even get to see other students from various universities. And that's exactly what Cosmo witnessed when we attended the grand opening ceremonies of the 73rd season of the UAAP, hosted by De La Salle University. (Click on this link to see some of their college cuties.) Students and alumni from all eight participating universities flocked to the Araneta Coliseum last Saturday, July 10, to watch the opening salvo (complete with "superheroes" and live performances from Lasallians Ogie Alcasid and Gary Valenciano) and the first back-to-back basketball matches (DLSU vs. University of the Philippines; University of Sto. Tomas vs. University of the East). DLSU won over UP, 80-62, while UST snatched a victory over UE, 80-67. Basketball may be a male-dominated sport, but we sure caught a lot of college girls in the cheering crowd. Some of them were even dressed quite fashionably, even if they were just in their casualwear. We interrupted their cheering for a while to ask them: What will be your look when watching the games this UAAP season: fasyon or laid-back? Why? We're really curious to know if college chicks and female sports fans would still want to dress up for a basketball game and why they would. Click through to the gallery and find out what kind of style we can expect from college chicks in the games this season. Tip: Always look your best when watching the games all season! Our Style Paparazzi might be roving! Here's your chance to be in Cosmo.ph!